Our useful and cute heart measuring spoons wedding favors are sure to capture the hearts of your guests. Perfect as wedding or shower favors. Each stainless steel spoon is engraved with traditional measurements on the back side (1/4 tsp, 1/2 tsp, 1 tsp, 1 TBSP) and loving notations on the other (A pinch of joy, A dash of tenderness, A spoonful of affection and A heap of love.) Each set of spoons comes beautifully packaged in a clear topped box with an organza bow and a "Love Beyond Measure" gift tag. These unique wedding favors are one of our most popular items! How many measuring spoons come in each favor? Also is there anyway that I would be able to receive my order before New Years? I would like to order between 25-30 favors. 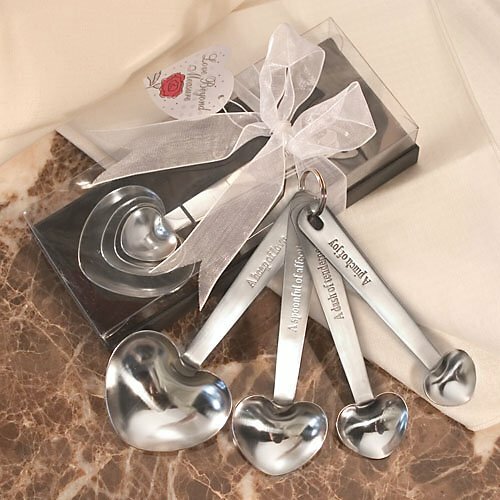 The Silver Heart Measuring Spoons Wedding Favors consist of 4 measuring spoons (1/4 tsp, 1/2 tsp, 1 tsp, 1 TBSP). Also, it takes 3 to 5 business days for processing and shipping but due to holiday season there could be a delay in delivery. You can enter your zip code in the delivery times section below the product description to get the estimate delivery date of this item. The Silver Heart Measuring Spoons Wedding Favors can't be personalized but you can purchase a personalized tag or label sticker separately here. Good day, what is the writing on the measuring set? When will Silver Heart Measuring Spoons Wedding Favors be back in stock. The wedding is December 23, 2018. Will it arrive in time? We expect them to be available November 15th. Once available, they take approximately 3 days to process and then ship from New York. Does the favors come personalized? If so,is there an extra charge?